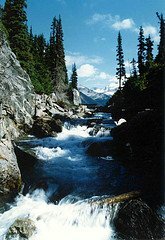 Whistler day trips to Garibaldi Lake. Hiking at its best. Whistler day trips certainly are varied. From a stroll around the village to hiking mountaintops. They cover the spectrum for every taste. This is the breathtaking Garibaldi Lake. Natures perfection. A jewel to be seen by all. Since the Black Tusk Recreation Area is located so conveniently close to such a large urban area, it can be a very busy one. We prefer to do this trail in June or September. Just keep in mind that it is not unusual to see a late or early snowfall as the high point has an elevation of 1500 m (5000 feet). 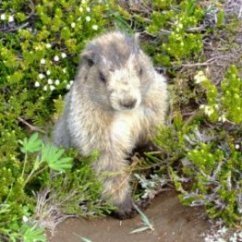 This is a photo of a Marmot.They live all over the coast mountains. During the summer they live on grasses and sedge. They hibernate under the deep snow all winter long, storing their energy by breathing very slowly. they give off a very high whistle when they become startled or want to chat with the neighbors. It is that whistle that gives the Village of Whistler it's name. This is not a pussycat hike by any means. The elevation gain is 900 m (3000 feet) and the round trip is 18 km (11 miles). Although there are a lot of avid hikers who do this hike in 6 or 7 hours, you should really consider taking the backpack and making use of the camping area up at the lake. This will give you plenty of time to enjoy the beauty of the area at a more leisurely pace. Either way, the extra effort to do this hike will be well worth it and you will forever remember this as one of the best Whistler day trips you have ever experienced. It takes a very special skill to not only see what might make a beautiful photo such as this one of Taylor Meadows. Thanks to the artistry of Ryan and Sabrina there are many more on their web page. Why not drop by and take a look..
Leave Whistler by turning south on highway 99 and drive approximately 19 km (12 miles) and turn left at the sign for the Rubble Creek Parking Lot. Continue on this road for 2.5 km (1 ½ miles) and you reach the Rubble Creek parking lot. Your elevation here is 600 m (2000 feet). This area was formed by the eruption of Mount Price during the second ice age when the molten lava flowing down met up with the huge ice sheet that filled the Cheakamus valley at that time. This resulted in a huge barrier of lava you will see during your hike. The trail for this whistler day trips from the parking lot is well graded and easy to navigate. It follows the north bank of Rubble Creek and soon becomes steeper and you go through a series of switchbacks through the cedar and fir forest. Just beyond the 6 km (3 ½ mile) point you will come to a well marked trail junction. Not far ahead is a trail off to the right where you get a nice view of the Rubble Creek Valley and The Barrier we talked about earlier. Back on the trail you will soon come to the emerald green Barrier Lake. 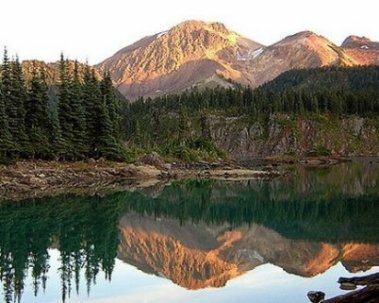 A short distance ahead brings you to the Lesser Garibaldi Lake. The outlets from these lakes are underground. Finally you will come to the Rangers Trail on your left. Now you cross Rubble Creek Bridge to the shores of Garibaldi Lake and the breathtaking view reflected in it’s emerald green waters of Sphinx glacier. Only a ten minute walk along the shore brings you to Battleship Islands campground and the end of the trail. If you intend to camp here all you need to do is select your spot and enjoy it. For those who stay to enjoy the area for another day and do more whistler day trips, you may go back across the outlet bridge and enjoy the two trails leading you towards the Black Tusk. This 25 million years old feature of black basalt is a volcanic plug and the oldest feature of Garibaldi Park. 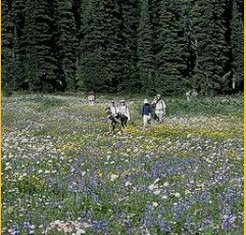 Those who wish to return to Taylor Meadows to camp and explore more whistler day trips, and take the trail back to the parking lot, may take the Rangers Trail. It branches right not far after crossing the outlet bridge. You will enjoy the view of the Black tusk from the area around the cabin. Follow the trail left and downhill and past the Taylor campgrounds. At the fork you passed earlier you turn back to the parking lot and home. Bears live in this area. You are in their backyard so to speak. When we travel in bear country we make noise where the bush closes in along the trail. Bears feed on berries and green foliage. That’s where they will spend plenty of time. Talking, knocking your hiking pole against a tree or blowing a whistle in tight bush will announce your presence and give the bears time to leave, or to at least avoid surprise. Bears have an amazing sense of smell. They will smell food through a backpack easily. When camping overnight in bear country sling a bear cache. Use a length of light nylon rope. Find two trees at least 10 feet apart. Find a solid branch about 15 feet off the ground. Tie one end to a rock or water bottle and throw the rope over the branch. Tie the other end to the tree. Pass the rope through the food pack and throw the rope over a branch of the second tree. Pull it taut and tie it to the tree. Now your food cache is suspended between the two trees about 10 feet off the ground. Whistler day trips should be safe ones. Please be careful. Remember, bears are great climbers but they will not be able to reach your food if done this way. Your tent is not the place to keep food. Dogs are not allowed in the parks as they chase bears. There is a camping charge so be prepared to leave your money (cash) in the envelope provided. All of your garbage must be carried out for disposal. Check here for other Amazing whistler Day Trips. Crater Rim Trail. Walk in an ancient volcanic crater.